Manganese is a brittle, hard, grey-white to silvery metal with the chemical symbol Mn. It is the fifth most abundant metal found in the Earth’s crust. Manganese serves as an important alloying agent. Manganese alloys are primarily used in the production of steel. Manganese enhances the strength, stiffness, hardness, toughness, hardenability, wear resistance, and forging and rolling qualities in steel. Manganese alloys are processed into different grades of superalloys and steel; therefore, these are employed in various industrial applications. Alloys with high manganese content possess properties such as ductility, formability, strain hardening, and strength level parameters, which reduce the weight of vehicles and improve resistance against effects of mechanical impact. Manganese increases the hardenability of steel. Manganese alloys are more durable as cost-effective as compared to other metals alloys. Demand for manganese-based steel alloys is increasing in automotive applications due to high demand for weight saving to reduce fuel consumption. Manganese and steel are alloyed together to reduce the weight of the component. Aluminum is alloyed with other elements, including manganese ore and silicomanganese, to create moderate-to-high strength, non-heat-treatable alloys that are readily weldable and corrosion-resistant. The addition of manganese alloys to steel creates favorable properties such as high thermal conductivity, good castability, high corrosion resistance, and machinability. The production cost of manganese alloys depends on key variables such as cost of power, cost of raw materials, cost of labor, and cost of transportation. The production process power intensive as it requires high temperatures and high power; therefore, the production cost is high. Thus, the high production cost and market volatility are projected to hamper the manganese alloys market. Several governments have imposed stringent mining regulations for the extraction of manganese. It ultimately hampers the production cost of manganese alloys. According to a report by the Bureau of Mines India, India is expected to experience a 5mtpa shortage of manganese ore by 2020. This likely to hamper the prices of manganese alloys. Implementation of stringent environment rules regarding water and air pollution in developing and developed countries is expected to affect the production of manganese alloys. The automotive industry was valued at US$ 74 Bn in 2015 and surpass US$ 260 Bn by 2026. Demand for steel is expected to increase rapidly due to rise in capacity expansion in the automotive industry. The global automotive industry, which includes passenger cars, trucks, and heavy duty vehicles, is expected to grow at a substantial pace during the forecast period. Around 91.5 million units of passenger cars and commercial vehicles were manufactured in 2018. Global sales of cars and commercial vehicles increased in the last few years. This, in turn, drives the demand for manganese alloys. 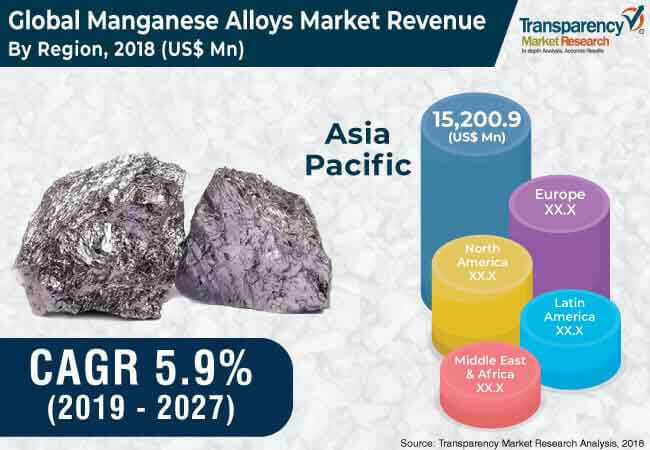 Based on region, the global manganese alloy market has been divided into North America, Latin America, Europe, Asia Pacific, and Middle East & Africa. Asia Pacific dominated the global market in 2018, as the region is an automotive and industrial hub. Moreover, the market in Asia Pacific is anticipated to expand at a significant pace during the forecast period due to the rise in demand for automobiles in the region, especially in developing countries such as China and India. Key players operating in the global manganese alloy market include ERAMET S.A., South32, Ferroglobe, ArcelorMittal, Jindal Stainless Ltd, Sakura Ferroalloys SDN BHD, Pertama Ferroalloys Sdn. Bhd., Mortex Group, Georgian American Alloys, Nikopol Ferroalloy Plant, and Maithan Alloys Ltd.
Manganese is a brittle, hard, grey-white to silvery metal with the chemical symbol Mn. It is primarily used in the production of steel. According to the International Manganese Institute, the global production of manganese increased to 13.8 million tons in 2018, as compared to that in 2017. This increased the demand for manganese alloys due to the rise in its use in automotive and infrastructure industries. Newly developed state-of-the-art manganese alloys treatments offer superior reliability. Manganese alloys are extensively used in the steel industry. The steel industry is one of the key consumer of manganese alloys. The global steel production in 2018 was around 1,800 million tons, out of which a majority of it is produced in countries such as India, China, Brazil, Mexico, and Iran. Governments of several countries are funding and supporting development and adoption of latest technologies in manufacturing environment friendly manganese alloys. The European Commission has published regulations imposing definitive safeguards on steel imported into the European Union. It aims in the development and deployment of innovative, CO2-mitigating technologies, improving resource efficiency, and fostering sustainable developments in Europe. Rise in demand for silicomanganese due to its cost effectiveness is expected to drive the global manganese alloys market during the forecast period. Developed and developing countries are investing significantly in offshore drilling. Demand for manganese alloys in Asia Pacific is gaining momentum due to the growth in the automobile industry and steelmaking activities, especially in countries such as China, India, Thailand, and Indonesia. This report analyzes and forecasts the manganese alloys market at global, regional, and country levels. The market has been forecast based on volume (kilo tons) and value (US$ Mn) from 2019 to 2027, considering 2018 as the base year. The study includes drivers and restraints of the global manganese alloys market. It also covers the impact of these drivers and restraints on the demand for manganese alloys during the forecast period. The report also highlights opportunities in the manganese alloys market at global and regional levels. The report includes detailed value chain analysis, which provides a comprehensive view of the global manganese alloys market. Porter’s Five Forces model for the manganese alloys market has been included to help understand the competitive landscape. The study encompasses market attractiveness analysis, wherein type, application, and region are benchmarked based on their market size, growth rate, and general attractiveness. The study provides a decisive view of the global manganese alloys market by segmenting it in terms of type, application, and region. Based on type, the manganese alloys market has been classified into high carbon ferromanganese, refined ferromanganese, and silicomanganese. In terms of application, the market has been divided into steel, superalloys, and others. These segments have been analyzed based on present and future trends. Regional segmentation includes current and forecast demand for manganese alloys in North America, Europe, Asia Pacific, Latin America, and Middle East & Africa. The global manganese alloys market has been provided in terms of volume (Kilo Tons) and value (US$ Mn). Market numbers have been estimated based on type and application of manganese alloys. Market revenue and volume have been provided in terms of global, regional, and country levels. The report comprises profiles of major companies operating in the global manganese alloys market. Companies such as Maithan Alloys, Arcelor Mittal, Jindal Stainless Steel, and Pertama Manganese Alloys account for majority share of the market. These players engage in developing new technologies and acquisitions to garner larger share of the market.